The Dubuque County Sheriff's office is asking for the public's assistance in locating two people wanted in connection to the Murder and Robbery of Collin Brown. The Sheriff's Office holds an active arrest warrant for Eric Dewayne Campbell Jr (30) for Murder in the First Degree and Robbery in the First Degree. He is considered to be armed and is described as being 5'11" tall and weighing 165 pounds. Adriannna M Chica (18) is wanted for Robbery in the Second Degree. She is described as being 5'2" tall and weighing 155 pounds. 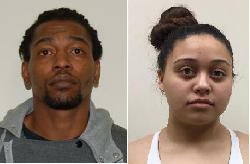 In the event that a citizen has information as to the whereabouts of either Campbell or Chica they should not attempt to apprehend them, but are asked to contact the Dubuque Law Enforcement Center at 563-583-1711 or the Dubuque and Jo Daviess County Crime Stoppers at 800-747-0117. The charges stem from an investigation by the Dubuque County Sheriff's Office and the Iowa Division of Criminal Investigation into the April 2, 2016 homicide death of 21 year old Collin Brown. On that date at approximately 2:01am the Dubuque County Sheriff's OFfice and the Dubuque Police Department responded to 9442 Noonan St Lot 749 for a report of shots fired. Collin Brown was found suffering from a gunshot wound and transported Mercy Hospital by the Key West Fire Deparmtent where he was pronounced dead. An autopsy conducted by the Iowa State Medical Examiner determined the Brown died as a result of the gunshot wound, and his death was ruled a homicide. The investigation determined that multiple male suspects, armed with handguns forcibly entered Brown's residence in an attempt to commit a robbery. Brown fled from his residence and was shot as he entered a nearby residence. Those involved fled the scene in a vehicle. Murder in the First Degree is a Class A felony and is punishable by life imprisonment. Robbery in the First Degree is a Class B felony and is punishable by up to 25 year imprisonment. Robbery in the Second Degree is a Class C felony punishable by up to 10 years imprisonment. The filing of a criminal charge is merely and accusation, and a defendant is presumed innocent unless proven guilty.